80-90% of U. S. silent films are LOST FOREVER! 50% of U.S. films made before 1951 are LOST FOREVER! While the academic community still clings to searching for lost films, as it should, it has become imperitive to also acknowledge the accessories - posters, pressbooks, stills, etc., especially when none of the film is left. Production stills are becoming the favorite historical verification because they are more abundant, easier to handle and easier to maintain.... BUT what good is it to preserve these historical production stills if you can’t identify them?? to help show how to utilize those codes to assist in the identification. Production Code Basics – For Movie Still Collectors is the first reference book written on how to use movie still production codes to help identify unknown movie stills and costumes. Production codes came into use around 1912 as the United States became the major international supplier of films and movie studios were driven to increase their production due to increased demand. By 1920 production codes were used by every major film studio and became an indispensable tool utilized in almost every department. Some studios even used production codes to mark their costumes and props. Production Code Basics – For Movie Still Collectors covers every phase from the initial creation and why they were needed and then, moves through the filming process to show the use of stills through each department. Also included is a breakdown of major studios and different variations each studio used. Explanations are included on the process outside of the major studios and cover such area as states rights, exports, independent studios, distribution, multiple markings and much more. 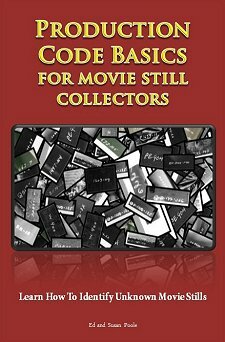 Production Code Basics – For Movie Still Collectors is the reference companion book to the authors popular Movie Still Identification Book that features over 45,000 production codes and is the only book of its kind as well. Ed and Susan Poole are film accessory researchers that have been in the industry for over 35 years. This is their 15th industry related reference book. The Pooles are on a quest to make sure that film accessories such as posters, stills, and pressbooks are not lost through neglect as silent films have been. THIS BOOK IS INCLUDED FREE WITH YOUR PURCHASE OF OUR 2013 MOVIE STILL IDENTIFICATION BOOK.